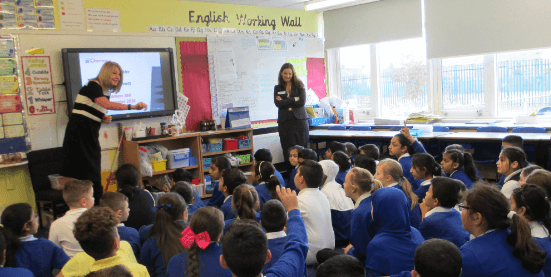 Julie Bennett, HR Manager; Paula Tinkler, Commercial Director and Christa Spencer, Senior Administrator at Chemoxy International Ltd visited Breckon Hill Primary School in Middlesbrough to talk to a group of 9 to 11 year olds about the world of work and their career choices. The children who go to Breckon Hill speak 30 different first languages between them with many of them coming from immigrant or travelling families. Hitting national targets for attainment is challenging but Cherry Diemoz, the school’s headteacher has placed the school’s focus on progress rather than attainment alone and P4C philosophy for children driving the school moto through everyday activities “always do your best”. The Chemoxy team had prepared an interactive presentation covering career options, having fun at work and being a great student and employee. A key aim of the school is to “encourage scientific curiosity to enable children to understand the world in which they live through investigation and problem solving” and Chemoxy is keen to support the teachers in this endeavour. The visit came on the same day a report was published by the End Child Poverty Coalition which sadly listed Middlesbrough in the worst position in the North East with 37 per cent of children in the town living in poverty – the regional average is 28.5 per cent. However, the team was delighted to find a group of well behaved, articulate, curious and aspirational children. They told the Chemoxy staff that they would like to be Doctors, Vets, Engineers, Police officers, Footballers and Wrestlers! Cherry notes “If we’re looking at the sort of deprivation we have in central Middlesbrough where jobs are at a premium, it’s very hard to get our children to see really good career choices,” she says. “They don’t tend to have a lot of good role models.” That’s where local businesses like Chemoxy can help. Chemoxy’s partnership with the school is one of ways to raise pupils’ aspirations and improve their employability. In fact, a report published by Teach First last month suggested that school pupils who interact with businesses tend to earn more in later life – it claimed that each employer contact is worth an extra 4.5% in future pay, on average. Chemoxy is looking forward to welcoming the older children to its “Children Challenging Industry” event in 2017 which has already seen 1000 children over the last twenty years come through its doors to be inspired about science and engineering. For Chemoxy, this was another chance to inspire future apprentices and engineers!